We have put on strongman and strongwoman comps since 2005. We have done local ones, we have done National Championships, we have put on Europe’s Strongest Woman, we have helped run televised comps for several federations and we have helped at the Arnold. 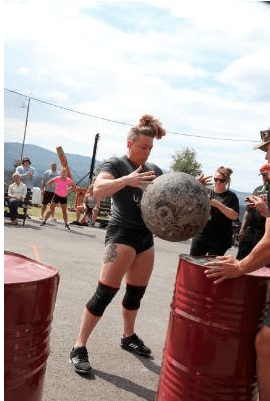 Never in our lives had we foreseen the atmosphere, energy and quality of what the Strongman Corporation Pro athletes brought to Fefor Arena this weekend. 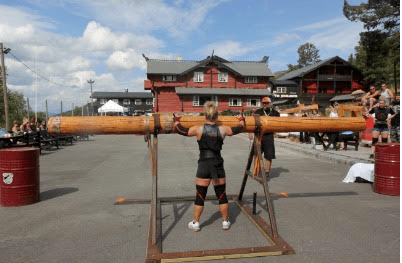 The massive Hercules Hold implement, the timber yoke and the power stairs built there had never before been used in a strongwoman competition. Would anyone even be able to hold on long enough for Patrick Rodgers to start his stop watch? After eventful travels for several of the athletes, all 21 athletes were gathered at Fetor Thursday night. Weigh ins and rules meeting were held, a very needed class in Norwegian phrases was also held, and then the athletes were ready for carbs before competition. Food is never a problem at Fefor, so my guess is that several of the athletes gained several pounds during the stay. The first event was the monstrous Hercules Hold, made out of massive wooden logs, engraved with runes – a though event even for the men. A slight adjustment was done so the implements should fit women, but beside that, the implement were just the same as the big guys have been using in several big contests. Friday night at 7 we were all ready. The guys who operated the apparatus was ready, Patrick were ready with his stop watch, Egil had rigged the live feed, and even the sun was on our side. The ladies started the competition, and all our fears of the implement being too heavy for the ladies disappeared like dew to the sun. It was totally awesome to see them stand there like goddesses, ruling what has been a thing for the men. After 1,5 hours all 21 athletes were done, and they could all go inside a fill up with well-deserved food and a good night’s sleep. Saturday dawned with bright sunshine and close to 90F, but according to the forecast there would be rain during the day. Our biggest concern where the atlas stones, since a monster series of 8 stones would be more than heavy enough in sunshine, and even worse in pouring rain. First event Saturday was truck pull, and at 10.30AM first athlete were ready in front of the 30.000lbs truck. Amongst the light weights athletes, Jess Theaker from Canada did the best pull. She was also the only one who finished all 60ft. Ashley Crawford was the winner of truck pull for the women, and Brooke Sousa was the fastest one in heavy weight. Second event Saturday- and third event in total – was the massive timber yoke you’ve seen Hafthor and all the big guys walk with. Small adjustments were done to make it fit the women, but still it looked impressive – and impressive it was. First out were the lightweight women who were carrying 465lbs for a distance of 65ft. All athletes finished the run, and all athletes came in faster than 18 seconds. The middle weights ran with 520lbs, and 8 out of 9 athletes came in under 60 seconds. The one who got the most applause was Kimberly Lawrance who had her first competition after her massive knee injury late last year. She fought her way through 13ft to massive applause from everyone at the arena. Fastest of all was Brooke Sousa in heavy weight, who ran the 65ft with 572lbs on her shoulders in impressive 9.85 seconds. Third event of the day were Extreme Atlas Stones – 8 stones for time, one at the time. 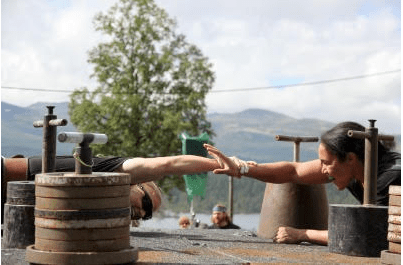 Each athlete had 60 seconds to finish all 8 stones. What made it even harder was that some of the stones were soul eating granite stones from Hell. 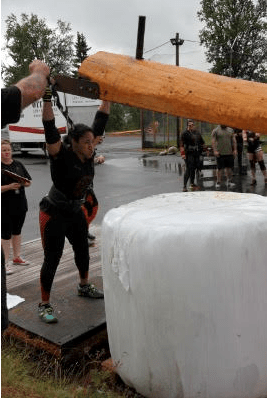 None of the athletes got up all 8 stones, and fastest of all 21 was Liefia Ingalls from USA who did 7 stones (165, 176, 198, 220, 246, 264 and 286lbs) on 23,56 sec. Winner of the event in light weight were Farah Fonseca from UK and in heavy weight it was Olga Liashcuck from Ukraine. Then the events for Saturday was over, and four minutes after the athletes left the arena, it started to pour. The crew tidied up and ran inside as well. The rain continued through all day, all night, and when we woke up Sunday it was still pouring. The athletes had been told on the rules meeting that the competition would go on – come rain, come snow, and every single one showed up on the arena at 10am as told. And … as they entered the arena, the rain stopped, and the Vikings could finally see that our sacrifice to the gods had helped. First event of the day – and second to last event in total – was Viking press. The light weights had 165lbs in hands, and best of all was Leslie Hofheins from USA with impressive 11 reps. 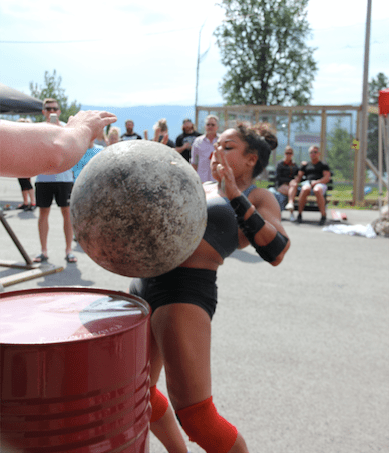 In middleweight they had to press 198lbs as many times as possible on 60 sec, and the winner of this class was Liefia Ingalls with 14 reps, followed by Sumer Johnson with 11 reps. In heavy weight Liashcuck and Fithen tied with 14 reps on 220lbs. Last event of the competition was power stairs, an event all the shorter athletes dreaded, and an event that made all the taller athletes praise their parents for good genes. 3 implements, weighing 264, 308 and 375lbs, was to be lifted as fast as possible up four TALL steps – a total of 12 steps. Of all 21 athletes, 4 managed all 12 steps, and fastest of them all was Olga Liashcuck with 30,72 seconds. Jess Theaker won the audience’s hearts when she crawled over the top of the stairs to cheer her friend Laura Anderson on after beating her in the event, and Kimberly Lawrance gave everyone a tear in the eye when she fought her way through 9 steps with Kikki standing behind her as safety. Sumer Johnson and Ashley Crawford congratulate each other after a tough 3 days of competing. And now we have to speak a bit about the atmosphere during the competition. The first few days, before weigh ins, you could feel the tension in the air at Fefor. There wasn’t much laughter, there wasn’t a lot of athletes gathering in the lobby … most of the athletes hang out in their rooms, or in the sauna, and once in a while one of us who wasn’t cutting weight had to check that everything was ok with them. Then – when the weigh ins were done, and everyone had done their job, you could once again hear laughter ringing in the old and venerable walls at Fefor. All athletes were eating, praising the food and the desserts, the pink cake and the rice pudding. Through events all athletes were cheering on each other. If anyone needed chalk, another athlete would run to find it. If anyone needed help warming up, a fellow competitor helped out. Athletes were laughing and crying together, and I have honestly never felt such a good atmosphere in any of the many competitions I have done or hosted. 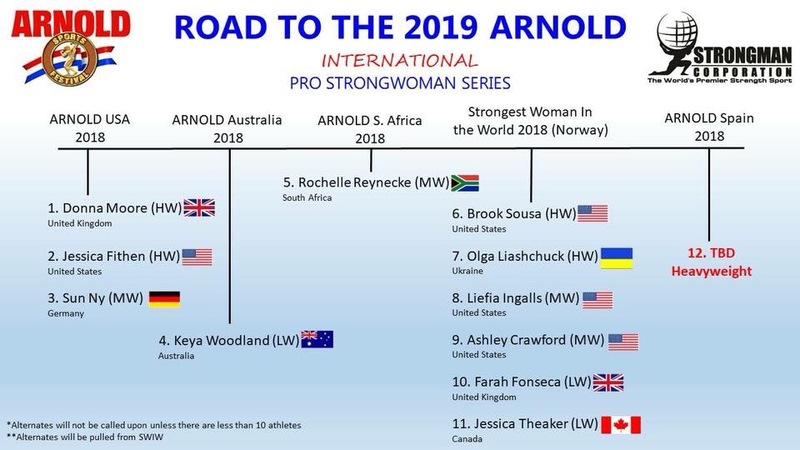 I am so incredible proud to be able to be a part of this piece of strongwoman history, and I do hope I will continue to be a part of this history for many years to come. Until next time; stay strong! Become a supporting member on Patron!